So after a year or two of wearing braces, your dilemma is not yet over! You will still need to wear retainers for at least 6 months in order to retain the realigned teeth in place, hence, the name retainers. Wear the retainer at all times, most especially during the first few days. You may feel discomfort initially such as salivating a lot. But once your mouth gets used to it, it will feel natural. Remember that this is how it was when you first started with braces too. After a few weeks, you can lessen the time you wear retainers such as only at night when you go to bed. Wearing is easy by the way. It may be a challenge at first but you’ll get used to it. Start with the upper set. Simply attach it to your gums and use your tongue to push it in place. The lower set requires perfect positioning and will make a snap on sound once it’s connected properly. Eating becomes a problem, which is why some only wear retainers at night after the last meal. 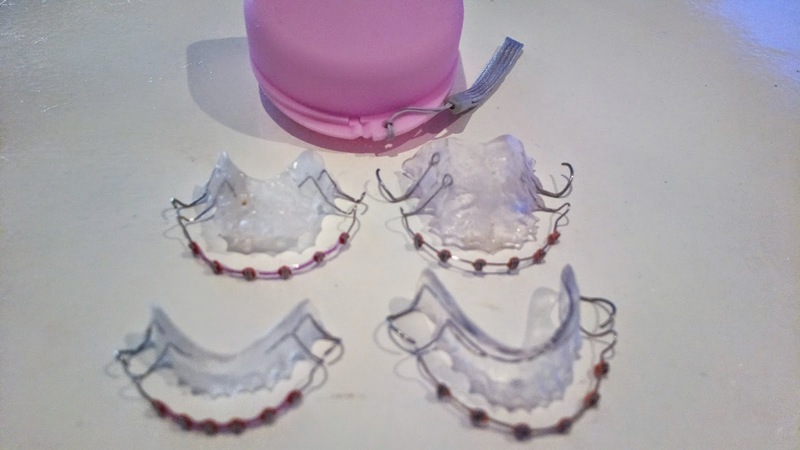 But you can actually remove them (for removable and not fixed type of retainers) prior to eating and slip them back in afterwards. Dining with retainers on will cause food to accumulate at the gum area which holds the retainers in place. But with or without retainers, be careful with the type of food you eat. Although the teeth are already conformed according to the alignment of the braces, they are susceptible to breakage and may revert to the original position. This happened to me while eating nilaga (meat bone stew). I have no idea what to do with the mini-space it created. I have asked the first dentist I worked with and she told me to ask for the new dentist to tighten the retainers in order to close the gap. Cleaning is easy. Just remove and wash with cold water. You should also brush it with toothpaste and rinse with mouthwash when attached to your teeth to avoid bacteria which causes a foul smell. Never soak it in hot water as it will deform the plastic and will no longer perfectly fit your gums. This happened to me only a few days after getting the first pair. I then needed new pairs right away. These are just a few tips that will help wearing retainers more bearable. Just think of the benefit it brings and I’m sure it’ll be a breeze in the same manner you wore braces for months.